Sometimes the only thing a photo lacks is a little bit of emotion. If you are one of those people who do not take their photos too seriously, there are plenty of ways for you to play with face photos: change face expressions, apply realistic emotions, warp the face making it look freaky or turn a photo into a cartoon to boost the fun. It can be done right in your browser with just a couple of clicks. First of all upload your photo to Cartoon.Pho.to. You can either choose to upload it from disk or via URL if the image already exists somewhere on the Internet. Move further and you will be able to make a person flirt, wink or raise eyebrows in surprise! Mix reality and pencil drawing! Inspiring, isn’t it? We were absolutely exited when saw it and decided to do our best to give you the opportunity to make such works of art. 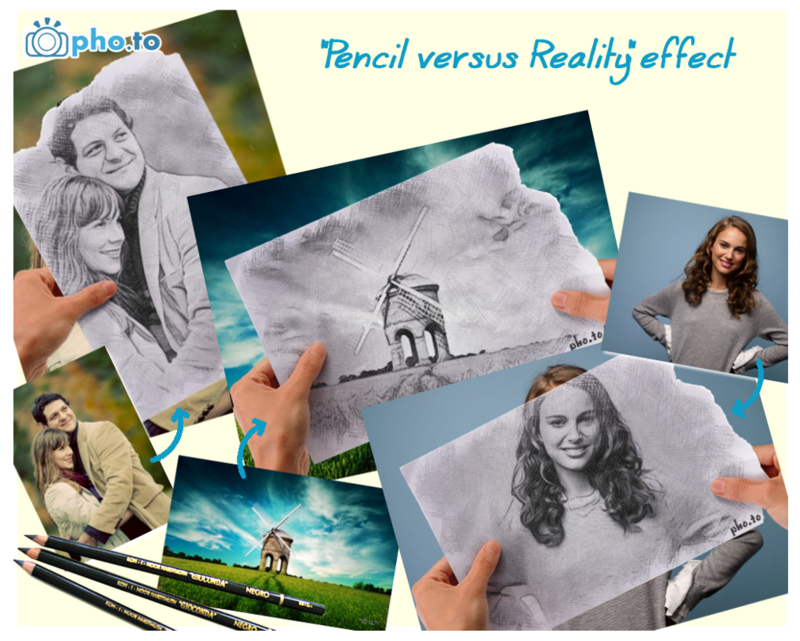 So… meet our new stunning template – “Pencil vs reality” . It is fully ready to turn your picture (а portrait, landscape, family photo, etc.) into a pencil drawing, leaving the background area “real”. 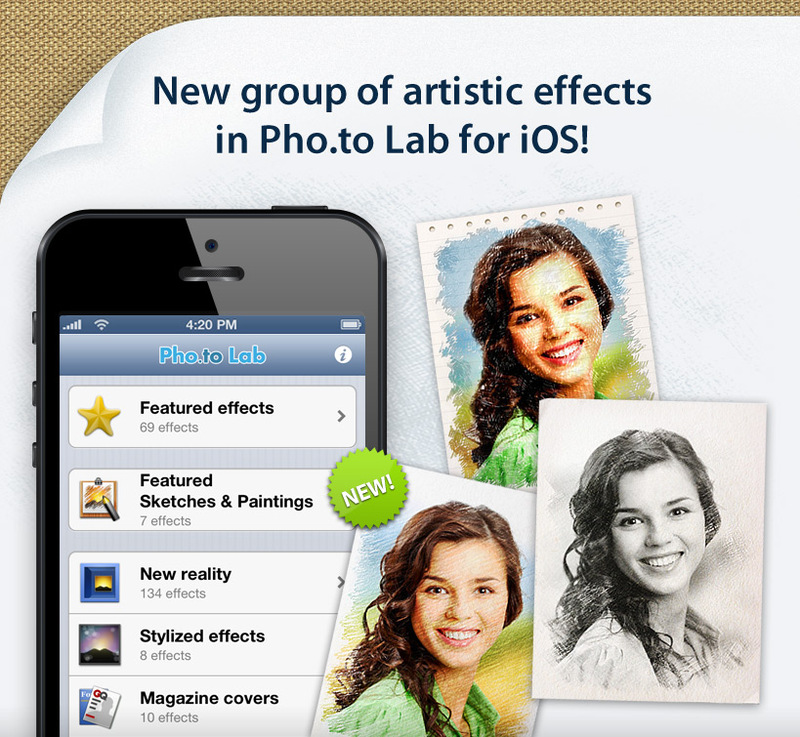 Pho.to Lab for iOS major update: featured artistic effects and more! New version of Pho.to Lab for iPhone and iPad is out! The update is a major one and brings a whole new group of truly artistic effects, that were only available in DEMO mode on our site before. With this update you will also get 3 new color emphasizing effects and will notice that effects previews are of better quality now. If you are a Funny.Pho.to loyal visitor you should already be familiar with “Featured Sketches and Paintings” templates. They aimed at turning your photos into paintings and drawings imitating a chosen technique. You can process your photo with seven of them: Trois Couleurs Drawing, Sanguine Drawing, Vintage Charcoal Sketch, Pastel Drawing, Graphite Pencil Sketch, Felt Tip Pen Drawing and Crayon Drawing. Starting from now, all the listed effects are available in every version of Pho.to Lab: free, PRO and PRO HD, but with one tiny difference: though you can apply any of these effects in any version, you must be a PRO user to be able to save the result to your gallery, instantly share it on Facebook, Twitter or Instagram or send it via email. And one more change related to this major update: effects from “Featured Sketches and Paintings” group at Funny.Pho.to service will have a limited functionality very soon. You will be able only to preview, not save or share the result. The only way to save and share the result is through the mobile app. This said, install the latest version of Pho.to Lab, take great pictures and make them even better right on your phone! Have you ever been proud of something enough to forget that “modesty is the virtue”? Then you will understand our wish to share a small portion of feedback we have been getting on the latest version of Pho.to Lab. Remember it’s not that we are boasting, we are just happy that most of you enjoy the improvements. So let’s go for it! Continue reading Pho.to Lab for iOS major update: featured artistic effects and more!